CHICAGO – Local Awards Season is coming up with the Best of the Midwest, honoring the 2018 film year of the Midwest Independent Film Festival. The Gala is on Thursday, January 17th, 2019, click here for tickets and information. The gala will be hosted by Amy Guth, who was named Executive Director of the “Midwest Indie” Fest in 2018. Her right hand behind-the-scenes Executive is Mike Kwielford, who oversaw a transition year for the Festival he co-founded in 2005. His hard work and persistence guided the Fest through several changes in 2018, including forming the hiring committee that appointed Ms. Guth as Executive Director. 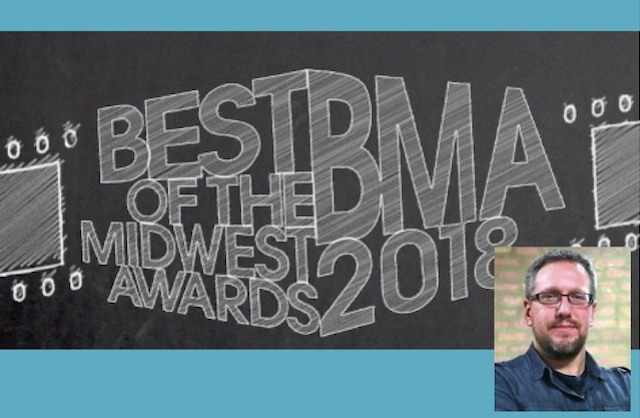 For a complete list of nominees for this year’s Best of the Midwest Awards, click here. Mike Kwielford is also a principal owner of Potenza Productions, as well as their cinematographer. He was a fledgling filmmaker in 1999 when he decided to create Chicago Community Cinema (CCC), as a way for area filmmakers to screen their works and to develop a collective. That evolved in 2005, when he co-founded (with Mike McNamara) the Midwest Independent Film Festival, morphing into the year round First Tuesday screenings to highlight Midwestern films and further develop the community (besides Chicago and Illinois, there is reach to Iowa, Indiana, Kansas, Michigan, Minnesota, Missouri, Nebraska, Ohio and Wisconsin). 14 years later, it’s still growing and going strong, and has transitioned seamlessly under new Executive Director Amy Guth. In a Podtalk with Patrick McDonald of HollywoodChicago.com, Midwest Independent Film Fest co-founder Mike Kwielford talks about the transitions of last year and looks ahead to 2019, including the Best of the Midwest Awards on Thursday, January 17th. Click here for a Podtalk with Amy Guth, Executive Director of the Midwest Independent film festival, with Patrick McDonald of HollywoodChicago.com. The Best of the Midwest Awards, honoring the Midwest Independent Film Festival year 2018 will be Thursday, January 17th, 2019 (7pm), at The Promontory Chicago, 5311 South Lake Park Avenue West, Chicago. For more information about the Midwest Independent Film Festival, click here.